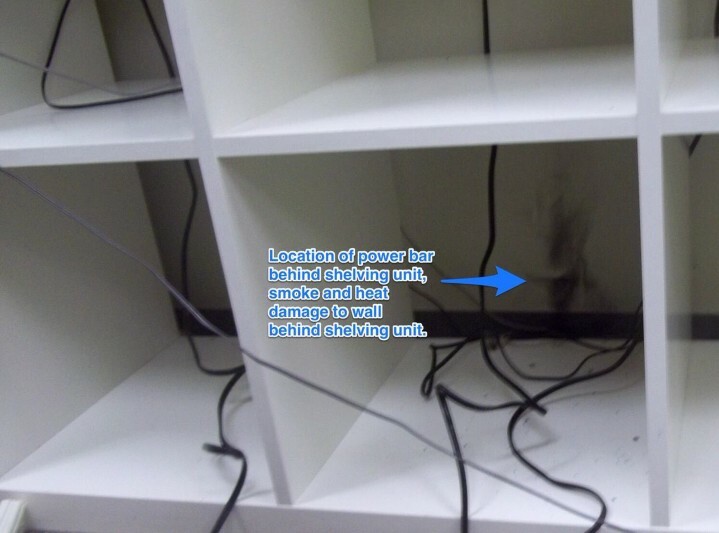 Electrical power bar began to smoke and burn in an interior office environment, behind an open shelving unit. 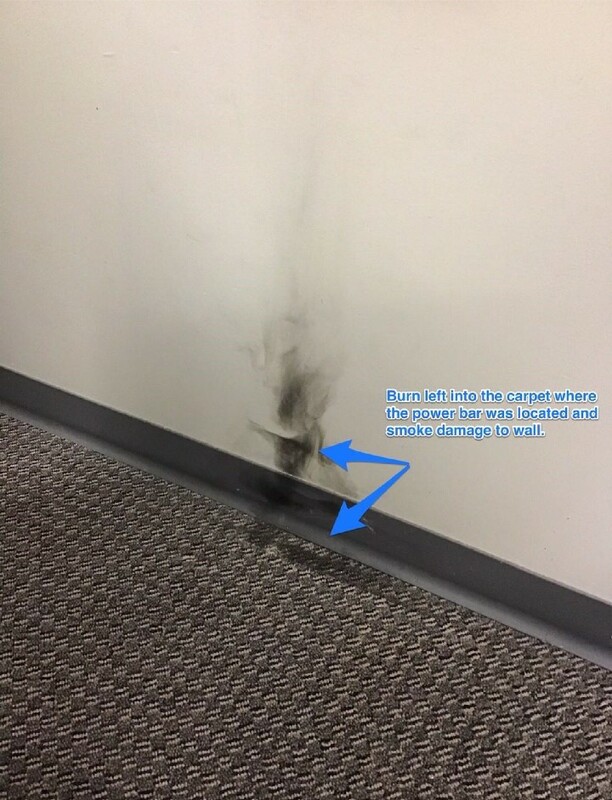 Heat and smoke damage has occurred to the power bar and the power bar is no longer operable. Electrical power bar was plugged in to a wall receptacle outlet. Power bars are plugged into wall receptacles to provide an increased number of receptacles at one location. Manufacturer’s electrical ratings: maximum voltage and amperage the power bar operates at safely. Certification mark from a recognized approval agency. This power bar had all markings listed above. There is potential for various failure scenario’s in this situation. Excessive loading of the power bar , exceeding the ratings on the power bar may cause an increase in temperature and failure of internal components due to excess electrical current. 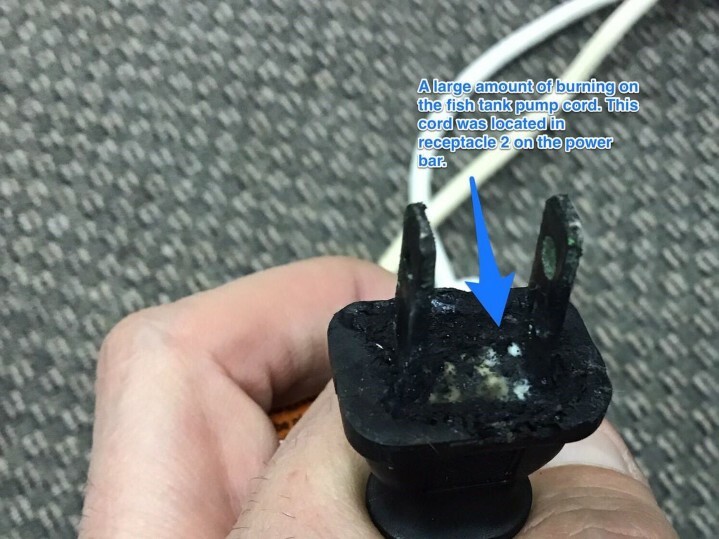 Damage to power bar due to abuse or hard usage, may have compromised internal protective measures and insulation between conductors. Malfunctioning overload device, heat can be created within the power bar due to this device not reacting and clearing the overload. The manufacturer’s ratings labelled on this power bar are: 125 volts, 15 amps, 60 Hertz, indoor use only. The above totals do not exceed the manufacturer’s amperage rating of the power bar. The above equipment was approved for use and the above information was provided by the manufacturer’s labels on the equipment. The phone, computer, and printer were all put back into use at other receptacles throughout this facility. The fish tank pump was not put back into use. During the interview process with the preschool manager who was in the office when the incident occurred, it was explained that this power bar has been used for other devices as well as the ones listed, vacuums, Christmas and Halloween decorations and cellular phone chargers have all been used at this power bar. Depending on what devices are installed, there is potential for exceeding the manufacturer’s amperage rating of the power bar. 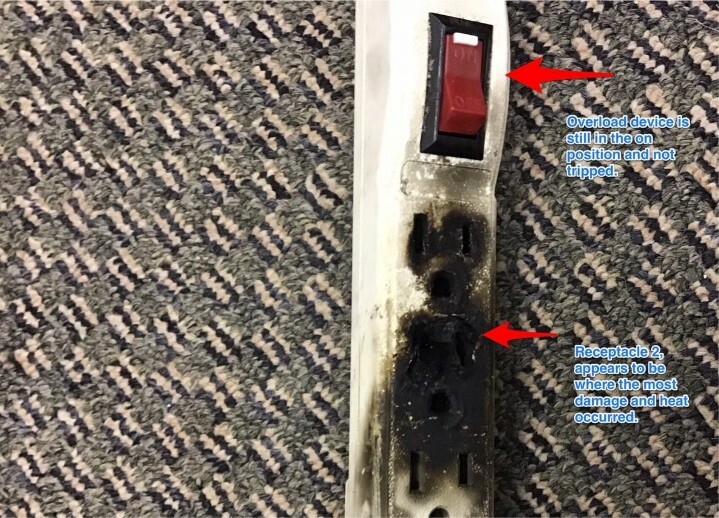 When the power bar was disassembled there were burn marks and signs of excessive heat between the Line(hot) buss and the grounding buss, there is insulating plastic installed between these two buses and that plastic is no longer present in this power bar. Short circuiting and high levels of heat would be created without this insulator. The overload switch was in the “on” position at the time of failure, with the power bar disassembled this switch was manually tested and it would open the circuit as required. This switch has an internal component that when operating correctly will sense an overload and open the switch to disconnect power to the equipment. The internal component of the switch is not accessible for testing. Without this switch and internal components operating as required, excess current flowing would create a strain and heat on the internal electrical components of the power bar. Excessive loading(exceeding manufacturers ratings), internal damage and a malfunctioning overload switch may have been the contributing factors for failure of this power bar. Damage description: Burning and heat damage occurred to interior and exterior components of an electrical power bar. Heat and smoke damage to surrounding area.